Haywood, NC.. He married (1) Sarah. He married (2) Lucy BEASLEY on January 27, 1820.
sergeant before he was discharged on April 4, 1777. Around 1780 John and Sarah settled in Burke County, NC. Buncombe in 1808 and Macon, formed from Haywood in 1828. In 1851 Jackson County was formed from Haywood and Macon Counties. John continued to lived in the Scotts Creek community until his death in 1833. 12, 1832. On May 13, 1833 he dictated his last will and testament, signing his name with an "X". Four months later, on Sep 17, 1833, John died and was buried beside his first wife Sarah in Dills Cemetery. John and Sarah's descendants have migrated from North Carolina to every state in the union. 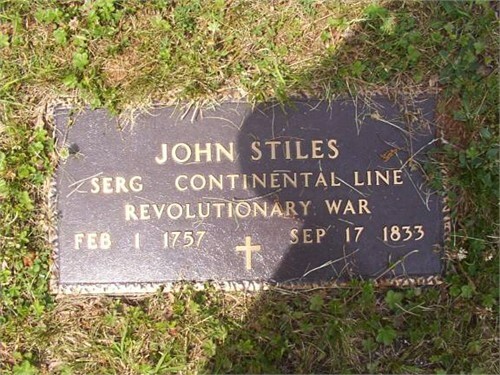 John Stiles Revolutionary War records; and North Carolina census records. C. Hatfield and Thomas (x) Stiles. Signed John (x) Stiles."